I have wanted to try out a round granny blanket pattern for a while now. 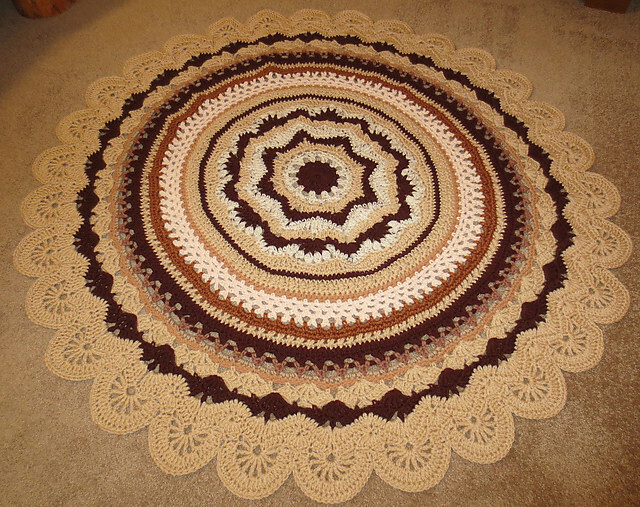 I used this round granny mandala pattern from Crochet from Raymond. It is an outstanding pattern with lots of pictures to help show how to create a beautiful round granny mandala blanket. This pattern can be used to blend different colors and assembling color fades creates so stunning granny mandala. One only needs to check out the over 600+ different completed blankets on Ravelry to be inspired to grab some yarn and start your own beautiful round granny mandala. 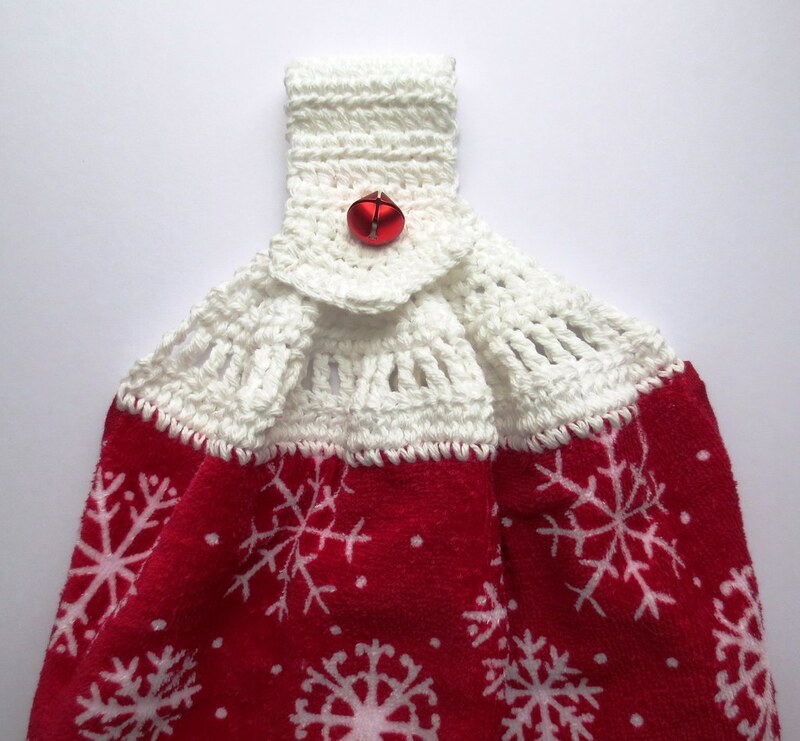 I crocheted several kitchen towel toppers last month for gifts. Now that Christmas is over, I can share them here on my blog. It seems that everyone enjoys receiving these handmade towels so every year I crochet a few of them for friends, co-workers, and family. I do try and not give them every year to the same people as I don’t want them to get tired of receiving them. 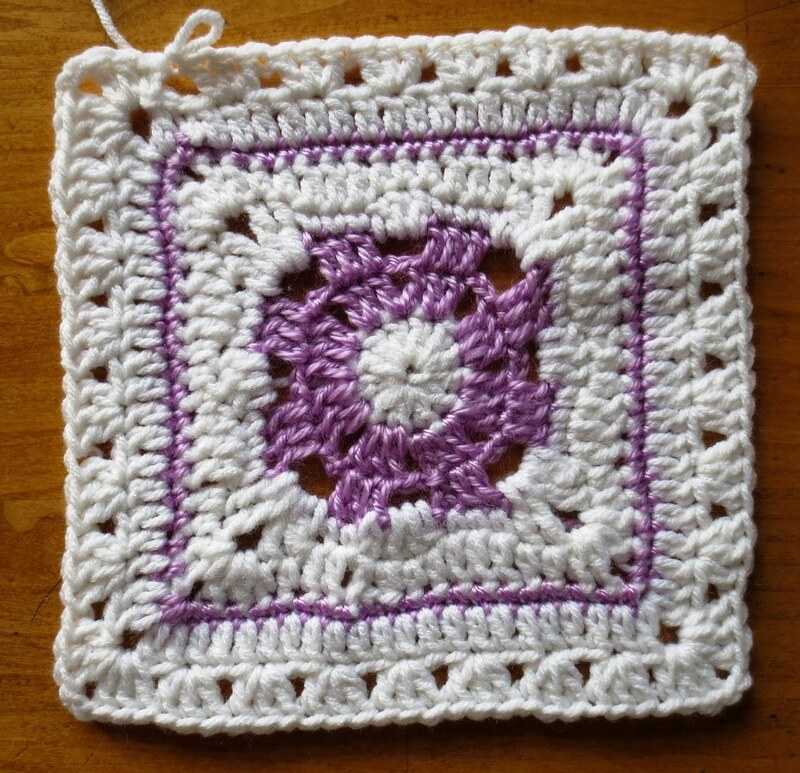 I crochet this beautiful Margaret Square. I wanted to continue and convert it over to a granny stitch square to create a baby blanket. So here is my mini tutorial on how I converted this crochet square over to a granny stitch blanket. Using a H (5 mm) crochet hook I slipped stitch over to the corner space and chained 3. Worked 2 more double crochet (DC) in corner and then chained 2, work 3 more DC in same corner space. Then skip 2 stitches and work 3 DC in next stitch, repeat this to next corner and work 3 DC, chain 2, and 3 DC all in corner space. Repeat around and end the row with a slip stitch into the top of the beginning chain 3. I discovered the rings of change blanket pattern on Ravelry and just fell in love with it. I used the mini blanket version to crochet a lapghan for the Warmth for Warriors organization. The mini rings of change pattern stops at row 42. I used a J (6 mm) crochet hook which resulted in my lapghan measuring 45 inches wide. Here is a closeup of the edging. Here are one Easter craft projects that I have been working on. 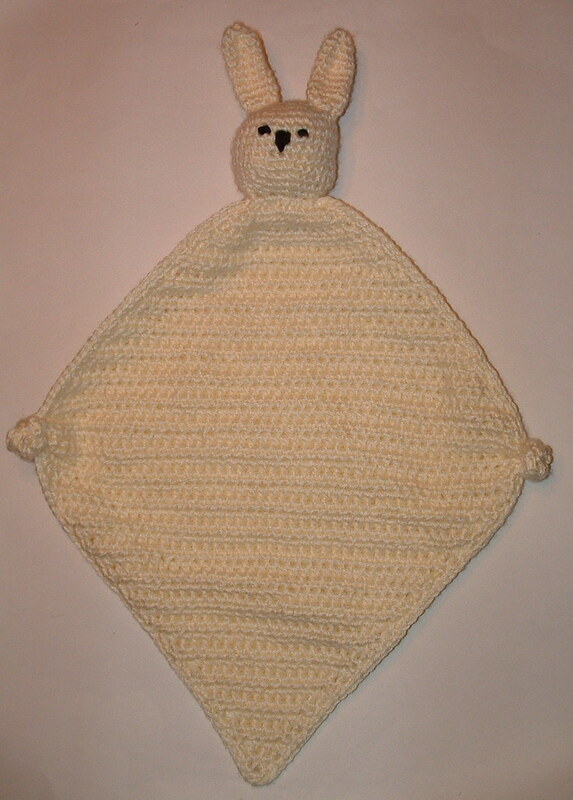 It is a blanket buddy that I crocheted for my newest granddaughter’s first Easter. 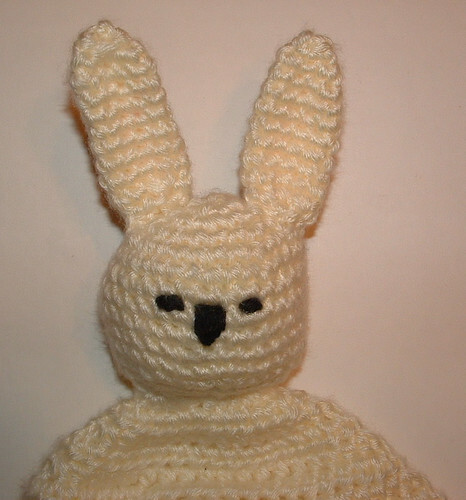 I crocheted it using this blanket buddy pattern but with some changes which I detail below. 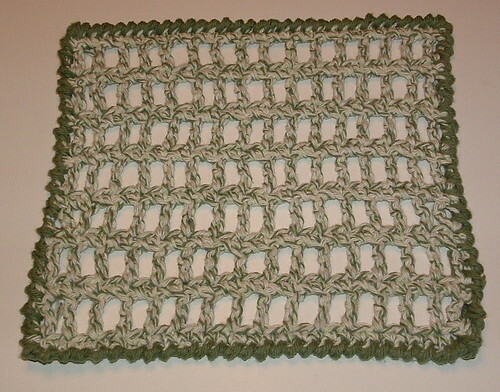 I used a H (5 mm) hook and crocheted with double strands of off-white Caron yarn. I did 20 rows on the blanket before I began the decrease portion. I know many people have said the blanket pattern as written was small so I wanted to make mine bigger. My finished blanket is 17 inches wide by 18 inches long not including the bunny head. I used black yarn to do the face. I worked on the face for quite some time and while I’m not completely happy with it, I’m finally calling it good. At least as good as I could get it. This week I crocheted a little bucket basket from recycled pink newspaper bags. I created this bucket basket as a gift to my local library for saving all the plastic newspaper bags they receive their newspapers in daily. Each week I pick up these bags and use them in my recycled crafting projects. I feel so fortunate to get these beautiful and uniquely colored bags. I recycled this jam container for my plastic bag crafting project. 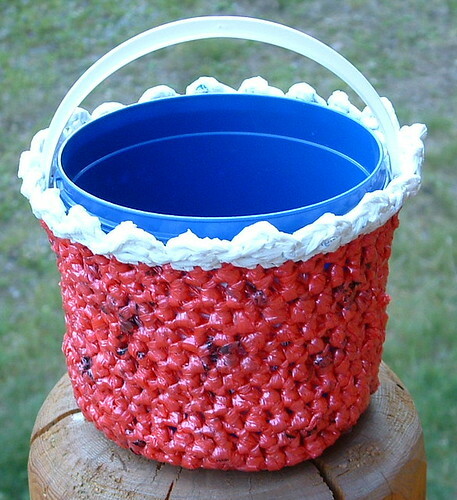 As outlined in the pattern below, you insert the plastic jam container inside the crocheted plarn bucket. Once finished, I filled the bucket with candy and presented it to my local library staff. This was their first time really seeing a finished product I crafted from their recycled plastic bags. I think they were happily surprised to see something pretty as well as useful made from their old newspaper bags that I collect from them. So I hope I have inspired you and you will give this recycled crochet basket project a go. Best wishes and happy green crafting to all! I’m back to share my latest recycled cassette tape craft project. I crocheted this little sachet bag with two strands of cassette tape along with one strand of ribbon yarn. The ribbon yarn gives the cassette tape a better texture to crochet with and makes the crochet hook move more easier. I added a sachet liner that I crocheted from some cotton thread so you could remove it from the cassette tape sachet. I filled the liner with some spicy potpourri before closing the end up. Then I just inserted the liner inside the sachet. This is a quick and easy recycled crafting project which requires just a small amount of materials. The result is a pretty sachet that makes a great gift idea.